Sodium carbonate is a household chemical with a variety of different uses. Its chemical formula, Na2CO3, is similar to that of baking soda, NaHCO3. But baking soda is a nontoxic chemical commonly used in food preparation, while sodium carbonate is toxic and should not be consumed. Instead, it's a common cleaning product sometimes used in laundry detergent and pool cleaners. Sodium carbonate is similar in chemical formula to both baking soda and chalk. It's more basic than baking soda, however, which makes it caustic and potentially harmful if swallowed. It's more water soluble than chalk, which doesn't dissolve well in the body. According to the "CRC Handbook of Chemistry and Physics," it's a crystalline white solid at room temperature, and has a melting point of 1564 degrees Fahrenheit. Sodium carbonate can absorb water from the air, making it decompose at lower temperatures. Chemically, the utility of sodium carbonate is largely as a cleaning agent. 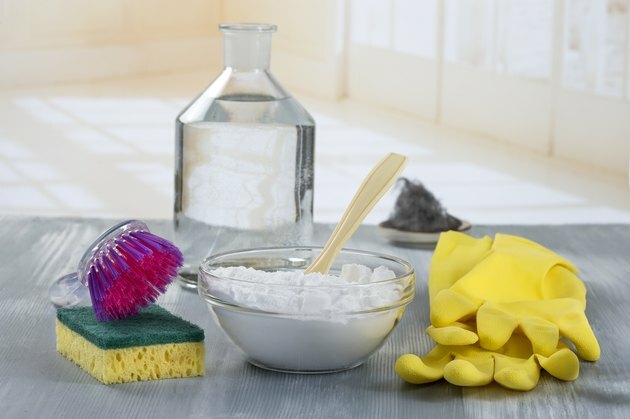 Commonly known as "washing soda," or "soda ash," it's a water softener and helps laundry detergents to lather more effectively, particularly when the water in which the laundry is being washed is hard, meaning that it contains magnesium or calcium salts. As Dr. Martin Silberberg explains in his book "Chemistry: The Molecular Nature of Matter and Change," the carbonate from sodium carbonate helps free soap molecules in hard water and increases their effectiveness. The sodium carbonate molecule is quite basic, or alkaline, meaning that it's the chemical opposite of an acid. Acids lower the pH of solutions, while bases, conversely, increase it. While the related chemical sodium bicarbonate, or baking soda, is a mild base, sodium carbonate is a much stronger base, notes the "CRC Handbook of Chemistry and Physics." As such, it can counteract acids in solution—for this reason it's sometimes used to neutralize acid in a swimming pool that's become too acidic. Sodium bicarbonate (baking soda) can be made from sodium carbonate by baking the sodium carbonate at a low heat; however, consult a medical or chemistry professional before doing so if you plan to ingest this compound. MedlinePlus notes that symptoms of poisoning with sodium carbonate can be quite severe, and may include diarrhea, vomiting, and difficulty swallowing. Because the compound is so caustic, MedlinePlus warns not to induce vomiting but instead to seek prompt medical treatment. While it is possible to use very small amounts of sodium carbonate in food—actually, this is done in some cases in which base is a desirable addition to food—in large amounts, sodium carbonate is toxic. The most common household sources of sodium carbonate are detergents and cleaners. Many laundry soaps and dishwasher detergents include sodium carbonate as an ingredient, notes MedlinePlus. Some bleaches also include the chemical, although more commonly bleach is chlorine-based. Since the products in which sodium carbonate is an ingredient generally include many toxic components, it's sometimes difficult to separate the effects of sodium carbonate from the effects of other molecules, but suffice it to say, sodium carbonate-containing cleaners should be considered poisons. What Is the Difference Between Glutamic Acid & Glutamate? Is it Safe to Use Sodium Bicarbonate During Pregnancy?